The physical technique for this is pretty easy, it's really an exaggerated form of adzing, or scraping. 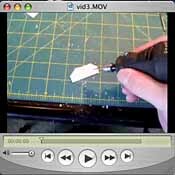 The trick is to really choke up on the Xacto and use your thumb to control the blade (like in the first photo). This is the probably the most important part to NOT cutting off your thumb. Please also note that in some (most) photos you'll only see one hand. Technical difficulty with my other camera meant that I didn't have the timer option when I shot these. Always hold the piece you are working on with BOTH hands. Controlling the piece and the knife you are using are paramount to saving yourself from injury. Now that the "I'm not responsible for clumsy cutters" disclaimer is over, 'ere We Go! Place the edge of the knife at a steep angle against the edge you want to chew up. Press your thumb against the opposite edge, drawing with your your knuckles, bringing the knife down into the plastic. Once the blade is down in the plastic a little bit, give your wrist a little flick and pull the knife up out of the plastic at a different angle, almost straight up from the piece. This should give you somewhat of a satisfactory "click" as you pull out a little bit. Now that you've seen the technique, here's what's going on in my mind as I'm pulling the blade against the edges. I start with a few long and shallow cuts, then change the angle to around 45 degrees make a more cuts, change the angle again to nearly parallel to the edge and make many small cuts, dragging many small knicks out of the edge. These are roughly the angles. Now here's the tricky part. This is paraphrasing from what I remember reading somewhere online, "be random, but not too random". Something like that. 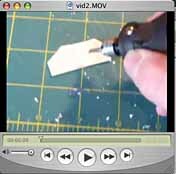 Go ahead and vary the angle, length of cut and depth of cut. There's no fast and hard rule about what happens when. 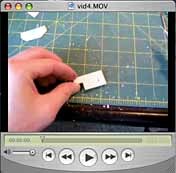 You can start using the little cuts first, or the long ones. The shallow angles don't have to be long, they can be short too. 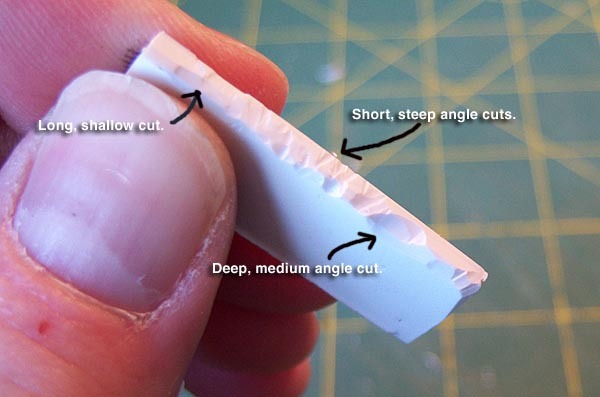 Be sure to randomize the cuts though - by that I mean don't do an edge that's all long cuts or all medium angles or all deep cuts. Switch it up a bit. Below is and example of an edge that exhibits all three traits. See how it looks cool and banged up? There's at least three layers of different angled cuts going on in a very random pattern, or "non-pattern" if you will, that makes this look like it's been hacked at and banged up pretty good. You can vary the concept under how the piece of metal got this way, kinda like it's story. 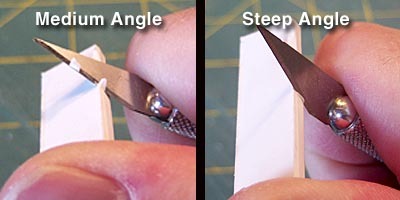 A recently hack-sawed off piece would consist of many small, steep angle cuts made at various angles to the edge like the photo below. This would leave a fresher, flat area closer to the edge for paint and such. The paint hasn't had the time to flake off near the edges. An older piece that's been around longer should have more dings, larger dents and basically more destruction to the edges, much like the piece in the original example at the top. This one's probably been attached, banged off, then bolted on again to another vehicle quite a few times in it's life. Much like these plates making up the top deck on my battlewagon. Notice the differing thicknesses of plate that make up the decking. 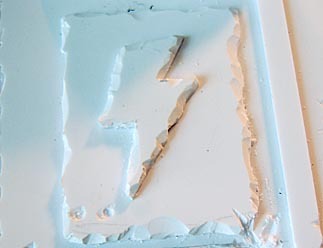 Thinner pieces usually only need one or two angles to achieve the battered look. it's also harder to include more angles as there just isn't the physical thickness to cut into. Bullet holes are really easy to do. 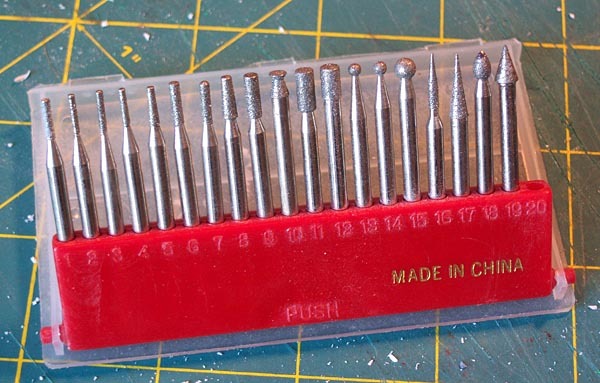 All you need is a small drill bit, preferable a few in varying sizes. As we learned in the previous section, variation is the key to interesting damage. Bullets come in all different sizes and so should the dings on armor! 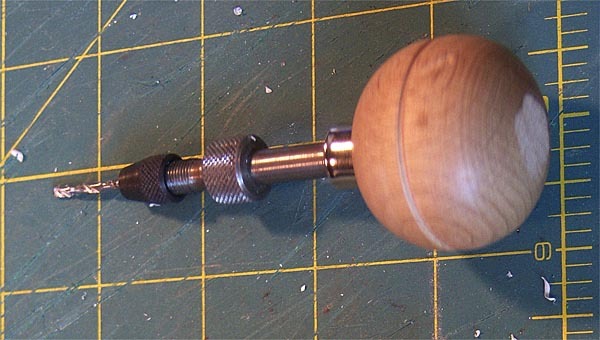 I use a pin-vice, also called a hand drill, to hold my bits (sound dirty, but it really isn't). You can use a Dremel-like tool for this but for this it's a bit overkill and frankly controlling a motor operated drill and NOT gouging straight through a thin piece of plastic is tough, even for the experienced modeler. That's why we buy hand drills. I'm using the piece of plastic from my earlier video example of edging, might as well finish it off and glue it down somewhere on the 'wagon. I can put some rivets one it as well to make it orky propa! Here's the progression below. 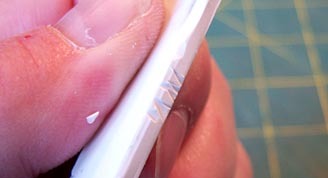 Draw dots, carefully drill down into the plastic, careful not to drill through the sheet. The last is what the bullet holes look like. Now, there's nothing wrong with going through. The reason I didn't go through is two fold. One, you need to paint/model something behind if you can see through it, and Two, going through needs to have one more step to accurately look like the went through and I haven't photographed that as I forgot when shooting for this tutorial (smacks forehead). Bullet holes that go clear through armor look better with the edges chipped out a bit, appearing to have "flaked" the armor as it went through. I'll try to remember to point this out in a later photo some time. Remember to switch up the bit sizes over the course of the model to simulate different caliber bullets that have successfully (or not) bounce off the armor. That's Bullet Holes for ya. On to the really fun stuff, EXPLOSIONS! 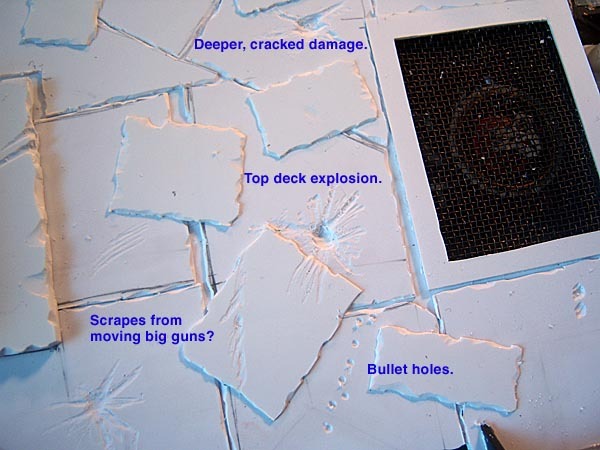 One of the coolest effects for battle damage is an explosion that rips across the surface, melting metal, viciously tearing off layer upon layer of steel. Some narrowly escaping with their green hides as the damage is contained to outside, some, as story of a successful penetration deep into the core of a vehicle. Was this a victim of a lucky shot at one time or did someone loot another smoking husk, not caring if there's a gaping hole in their hull? What ever the story is, an explosion mark adds a lot of drama and visual interest to a piece. These marks take some extra tools and a little practice. Standard disclaimer! Be smart when using powertools, or any other tools for that matter, please. Don't point toward your eye, aim it at a friend, drill into something without looking. This hobby needs all the people we can get and we don't want Darwin claiming any of our own. Safety glasses are throughly encouraged when using the Dremel motortool. Here are some tools that I like to use. Twist bit/hand drill/pin vice. Mine is a stout version with a wooden ball at the end. Got this one about 20 years ago and I like how it fits in the palm without wearing my hand or wrist out. 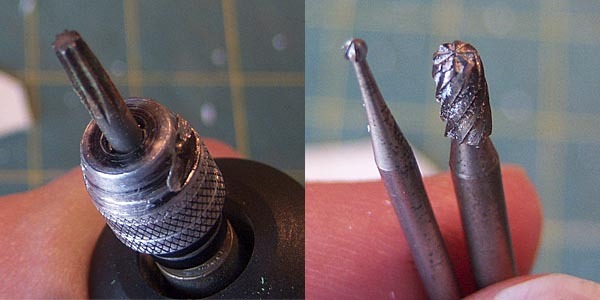 The next shot shows some of the bits I use in my Dremel. The first one is a general purpose gouger/reamer. The second two are more detail oriented, making smaller lines and gouges. The third one is a multi-pack of grinding bits. I got these at a discount tool warehouse for really cheap. These work on metals as well as plastics and should cover nearly every need you could come up with. I'll show the technique first, again, and then cover the thought process behind the madness. I start by drilling a bullet like hole. Easy! Depending on the story for your damage you could put it all the way through or not. For this tutorial I'm choosing a ricochet so the damage will not go all the way through. This will be the deepest part of the damage area. Not that it won't always be the center, although it will be in this one. Once I''ve drilled the hole with my hand drill, I break out the motortool and put in a rough grinder/cutter bit. I'm going to grind out lines that radiate outward from the hole representing the blast area. The lines should get smaller, almost to points as you get further out from the center. I've included a video link like before to show you how I've done this, it just makes it easier to see it in action than just describing it. When making your explosion damage, think about what's doing the damage and what direction it's coming from. If the shell went off farther away from the armor, the explosion site will be smaller, the central hole will be smaller to but the splash area will be larger. A closer explosion or more powerful detonation will leave a larger crater and more radiated splashes. Did the round come straight in, perpendicular to the armor? Or maybe it came in at and angle, the explosion bouncing harmlessly off the steel? Here's some example drawn out to show how you can switch it up. Here's what the test piece looks like after the first treatment. It looks darker than normal due to bad photography. Sorry. After I've routed out the larger portions, I'll go back with a very fine burring bit and add a bit of smaller scrapes and lengthen the deeper gouges to extend the damage a bit. This represents smaller shrapnel bouncing off and traveling away from the central explosion. I chose the smaller bit I showed you before. I didn't take a pick, but I do have a video showing the cleaning up and smaller details I carved in. That's pretty much it for the explosives. On to the last details....DETAILS! Last but not least, grazing and glancing scratches and smaller details. These are things like physical attacks from big choppas and powerklaws, maybe even damage left from two vehicles ramming each other. Again, I use the Dremel with a very small grinding bit - the small pointed bits I showed earlier are perfect for this. I've got one last video showing how I do this - It's very quick and takes some practice as with any powertool, it takes a while to get used to how it will react once you place it on the surface. And here's a close up of the test piece showing scraps and scratches. Notice how the scratches on the right edge of the piece look more interesting? This adds more depth to the piece, incorporating more than one surface and breaks up the straight edge. Below are some examples of these techniques used on my battlewagon in process. Notice how some of the splash damage covers more than one surface like the banding straps or the ladder. This shows much more character than if the effect was constricted to one piece of plating. Now these techniques are not all inclusive, just the way I do it. Feel free to explore and expand on these basics. Keep your eyes out for tools and go look at destroyed metals - your local junkyard, online pics. Not only are these great resources for simulating damage while you're in the building phase, you can use them when you're painting too! Good luck and hope this tutorial has done you more good than bad. Take a piece of plasticard and chew on it, concentrating on the edges.